The great 2007 ice crunch – it wasn't just melt | Watts Up With That? At the beginning of May, ice thickness was about three metres in the center of the red square. By mid-June it was getting thicker, and by early September it was close to five metres thick! During the notorious summer of “record melt” which we have been told about ad nauseum, the ice thickness near the most affected area increased by 60%. What could have caused this? Simple – the ice was compacting to the north as it was pushed by southerly winds. It lost area – while it gained thickness. The NSIDC news from September, 2007 touched peripherally on this idea, without actually mentioning the critical point. Exaggerated animation of thickness gain from compression. For effect only. A good analogy would be shoveling the snow off your driveway. As you push the shovel forwards, the area of snow decreases – but the thickness of the snow increases in front of the shovel. Now on to 2010. 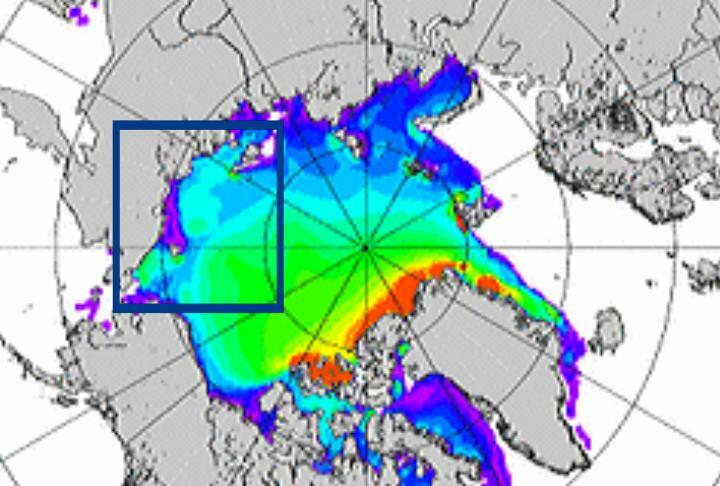 Note in the images below that ice in the Chukchi and East Siberian seas is thicker this year than it was on this date in 2007. In some locations it is as much as 5 metres thick in 2010. The AGW chameleon changes it’s colours constantly. It complains about area and extent when convenient, and about thickness when convenient. I am coming to the conclusion that the 2007 melt was more of a marketing event than a climatological event. The graph below gives a feel for just how much of a non-event it was. 2007 was 1.5 standard deviations off the 30 year extent trend, but apparently a lot of the supposedly “melted” ice just crumpled up into more survivable thick ice. One of the ice experts must have known this. Surprising that it took the “breathtakingly ignorant” WUWT to point it out. Currently the NIC uses the Polar Ice Prediction System (PIPS) version 2.0 as the basis for its “operational” short-term (24–120 h) sea ice forecasts. These forecasts are evaluated daily and amended by skilled analysts using reconnaissance data (if available), the most recent weather charts and data, and historical knowledge of the conditions in the area to provide the highest quality forecasts possible out to 120 h. Special emphasis in these forecasts is placed on the location of the ice edge and the conditions in the marginal ice zone (MIZ), as these are the most critical operational areas for marine transportation and safety. May 28, 2010 in Arctic, Sea ice, Uncategorized. If the this truth ever got out, you know the mantra will morph into CAGW causing unusual tidal gyres or air circulation patterns in the Arctic that in turn drive the ice loss. A chameleon can change his colors at the drop of a hat and doesn’t feel the worse for it! The SOTC press release on the 2007 sea ice minimum does note the effect of the wind pushing the ice away from Siberia, but emphasizes melting. 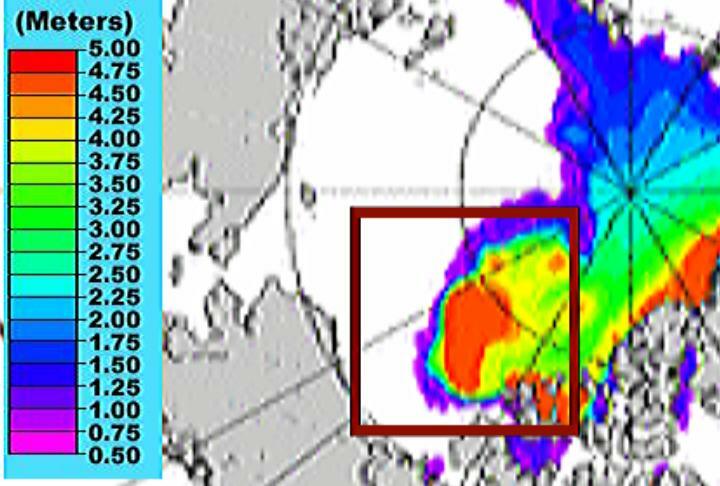 If these thickness estimates are reliable, it should be possible to calculate the one important parameter in this process: sea ice volume. Now I really wonder how September 2007 compares to other autumns in this respect! Meaning Atmospheric pressure has an effect on ice formations. theres NO way, they also didnt manage to figure this out..but telling people was NOT on their agenda was it? Now, whenever I hear a single warmie statement I am so close to screaming! so much has proved to be falsified, intentional untruths aka LIES! and most is unverifiable. australias CSIRO coastal survey advert here is just another money wasting govt con. the CSIRO climate warming fightback..15 million when we are in debt? for a fictitous issue? sooner KRudd and W(r)ong and garrotte and R guano are OUT the better for us all! As a long time snow shoveler it’s very clear that matter doesn’t just magically disappear otherwise snow shoveling would be a lot easier to do. Wow, it’s nice to find the evidence of this reduction of area without it all being a reduction in volume. I wonder how this might apply to other years? How can the ice volume be computed? How accurate would such computations be? How do we know? How were the ice depth measurements obtained? Satellite? Which? What is the “chain of custody” of that data? Depending on how much ice volume crumpled up into the pile as opposed to melting this could invalidate the use of ice area alone as an indicator of how much ice there is in the arctic. Oh, “open chain of custody” is an appropriate term and standard to use for all scientific data that is collected, processed (including all manipulations), and used in any conclusions presented to any politicians or to the public. Data can’t be or shouldn’t be trusted unless it has a high integrity in it’s “open chain of custody” that can be shown to any who ask for it. It’s been said before – never let the truth get in the way of a good story. CAGWists are running scared and trying every avenue to justify their position. Notably, the propaganda goes into ridiculous overdrive to create alarmism, which promotes attention. “Global Warming will cause more.. umm.. EVERYTHING!” they spout in ever increasing wails for lazy funding and a slack job to go to in the morning. It’s far more difficult for us Climate Realists to have our voice heard over the whining din, however the real truth shall never be silenced. Where Siberia decreased temperatures while Hudson Bay increased. Then we can have an idea what moves winds and climate. What AGWrs´Marketing managing will be planning for this year, as a preparation to achieve their goal of Global Socialist Governance in Cancun? Better ice be 0 inches thick than 1 mile + thick. Ice comes and Ice goes only where the wind blows. The hot earthers are once again making much ado about nothing. In the interesting of fiscal responsibility, we need to cut their funding to zero as they are contributing to the burning of the federal treasury. Should be interest in lieu of interesting. Need an edit feature badly for those of us with alternatively slow and fast fingers. So, the earth has cycles and changes and it isn’t all our fault? What a surprise! It would be very interesting to see the internal emails about this. They had to know, and therefore it can be inferred that the false, alarming impression was intentionally made. This is a clear and consistent pattern. How can so many supposedly smart people be so willing to go along with this stuff? More marketing the politics than analyzing the data. As again real scientists prove that the earth, is indeed, not flat. Well thank goodness that the science was settled before you discovered this . . . otherwise the science wouldn’t be settled. No wait, that can’t be right . . . . that logic doesn’t hide any declines. This is like the ACE readings for Hurricanes. Area of ice coverage is like the count of named storms. Mass of ice is like the amount of energy of the named. Huh. That is interesting. I did not realize you could get that significant an increase in thickness over a significant area in size *during* melt season. Extent has always been an imperfect metric –but it is what we have for a long enough period and great enuf granularity (daily) to be worthwhile saying anything about in historical terms (and even that, just barely –I’d much prefer we had it back to 1945 or so). Yes, volume would be better –and when we have 20 years of daily (or even weekly) volume data that’ll be worth saying something about. Even the snapshots from ICECAP did not have enough granularity to be all that useful for historical comparison even in the handful of years it operated. So we should ignore ice extent, and instead emphasize ice volume? Just a thought, but it seems to me that if thickness can be measured and area can be measured then using volume as the measure for comparison would resolve the argument. Steve, with thickness and area data it’s a simple calculation to get ice volume and that would be an interesting metric to compare over years. Last night on “As it happens” (A CBC radio program) they interviewed the new climate person at the UN. She described Canada’s contributions to climate change as “not having reached their Kyoto commitment and their new targets are even lower.” Maybe Harper is not as bad as I usually find him. I also contacted our Auditor General as well as Environment Canada to ask them how much of our tax dollars were being spent on carbon dioxide reduction and other AGW items. The AG replied that it was not an item that it verified and EC said that they had no budget for AGW so had spent no money on that item. I will continue to ferret out how many of our (Canadian) tax dollars are being wasted on this “model” situation. So what’s your take on the current ‘melt’ we hear so much about? Do we have evidence of persistence of the thickened and hence more survivable ice over the subsequent three years? More importantly, has ice volume changed substantially and if so in what direction? Steve, thanks for staying on top of this. If I remember correctly, NASA did issue a statement in 2008? that the ice had not melted in the minimum of 2007, rather it was compacted by unusual currents and winds. This didn’t apparently sink in for the CAGW crowd. On another note, I made a joke a few weeks back about the dearth of ticks. Seriously, after nearly forty years in Colorado, I have seen 2-4 ticks per week until things dry out in June. In 2009 I saw 3-4 ticks total. This year none, and I’ve been clearing brush for weeks and should see a higher than normal incidence. It seems odd to me. Data from the National Oceanic and Atmospheric Administration, a United States agency, show that globally, this winter was the fifth warmest in history. Just saying. Please no more igloos in DC or dumb crap like that. Do you have the computer horsepower to compute the ice volume? I could make an estimate of the ice volume by counting and numerically integrating pixels, but it would be nice to have access to the original data which the maps were derived from. It’s like the “melting glaciers” meme. They are vanishing, in those areas where they aren’t bulking up, because of a lack of precipitation not because of heat. Unfortunately the warmistas can’t tell us how the CO2 thingy is causing that so they give the melting rather than flowing downhill as they always do, and have little or no replenishment. Here in Zimbabwe the ability to grow crops was destroyed for political reasons but my government wants “Global Warming Money” to compensate for the crop failures. Rain, temperature, soil and crop types are all as they ever were within normal variations but we love the thought of the evil west giving us money to bail us out of our own ignorance. Sounds like Global Socialism to me. I think we heard that the ice had been pushed and/or possibly compacted horizontally, but I don’t remember hearing any press releases discussing thickening. My take at the time was that the ice had been pushed out into the Atlantic where it melted. Plenty of ways to cook data. that’s why AGW is the perfect lie to tell to lay people. “A new NASA-led study found a 23-percent loss in the extent of the Arctic’s thick, year-round sea ice cover during the past two winters. This drastic reduction of perennial winter sea ice is the primary cause of this summer’s fastest-ever sea ice retreat on record and subsequent smallest-ever extent of total Arctic coverage. I want to know what is the definiton of “thick”? 1m, 2m, 3m, 4m, or 5m? I was under the impression that wind-pushed ice stacked up to become thick, did not melt through, and this was how ice became multi-year ice. I am pretty sure that the Arctic is not going to be ice free in the summer during any of our lifetimes. It is too cold, and the sun isn’t out long enough to melt it all before it starts freezing again. But now you agree that we should focus on ice volume? As is true at sometime every year (since 1979), global sea ice area is above the 30 year average. Gee. I never would’ve figured this out. I’se jess a tater couch hick from Orgun, hyuck hyuck. That’s because it gets warmer every year in places where they don’t have thermometers. The cure for global warming is more thermometers in remote places. It’s a kind of voodoo. All factors count and make it seem more like a “weather event” than any real change. For those posters who are opening their mouths and proving something, I’ve been talking about ice compaction since day one. It is a simple mind experiment involving ice behavior, surface wind, and the nearly landlocked bowl we call the Arctic. Hell, kids playing cotton ball airhocky can figure this out. That is a great animation, Mr. Goddard. In the classical Stefan problem — heat removed from the surface of an ice sheet with constant lower-boundary temperature, the increase of thickness goes as square-root of time. To double the thickness of first year ice takes four years. Here the doubling took mere weeks. I think it is hard to compute the volume of pressure ridges. If they show at all, in the various maps of the arctic, they only appear as spiderweb-thin lines. Pressure ridges can be jumbles of ice twenty feet high, (perhaps as seen in the far distance of the photo you use to illustrate a pressure ridge.) If nine tenths of an iceburg is under water, the unseen part of a pressure ridge extends downwards one-hundred-eighty feet (and is a hazard for subs.) The total thickness would be two hundred feet, or roughly 65 meters. There is never any mention of ice 65 meters thick in Alarmist descriptions of the arctic. While it is true these thick areas of pressure-ridge ice would be like hairs, on any map of total ice extent, I feel they make computing “volume” all the more difficult. Steve said: The graph below gives a feel for just how much of a non-event it was. 2007 was 1.5 standard deviations off the 30 year extent trend, but apparently a lot of the supposedly “melted” ice just crumpled up into more survivable thick ice. I’m sorry Steve, but I don’t follow what you are saying about the 2007 melt being a non-event. The graph shows a drop in September ice extent from 6 t0 4 in 2006-2007, which is the same amount in one year that your trend line declines ( 8 to 6) over the entire 30-year period, and while you say “a lot of the supposedly melted ice just crumpled into more survivable thick ice” you don’t quantify what you mean by a lot. It doesn’t look like a lot to me. But the most serious flaw in the analysis may be assuming ice didn’t crumple up during previous year’s melts, if that’s what you are implying. If it did crumple up, then that is reflected in your chart on September ice extent for the entire 1978-2009 period, and therefore the drop in ice extent from 6 to 4 in 2006-2007 is a measure of change which takes the crumpling into account. I notice that the scale only goes up to 5m. It’s likely that some of the ice was/is even thicker than that. Very nice analysis, Steve! Thank you for informing us WUWT readers. On the other hand, for those who has it as a daily job to analyze these things, I would say that it would be expected to notice this. And when noticed, it is incredibly sneaky to hide it. Shameful, it is. So there it is; Either incredibly stupid, or incredibly sneaky. Will be interesting to see the comments from the GAIA believers. At the beginning of May, ice thickness was about three metres in the center of the red square. By mid-June it was getting thicker, and by early September it was close to five metres thick! So the model results that you present show a patch of thick ice in October, here’s what it looked like in Jan. 2008 when there was a ‘massive breakup’ of the Beaufort Ice and then washed away. I think you’re right. It hadn’t occurred to me at the time, but the same pushing/compacting horizontally would also thicken the ice not pushed into the North Atlantic. I don’t understand. Can’t anyone here just Google ‘arctic sea ice volume anomaly’ ? Climate scientists have been talking about the declining sea ice volume for years. They will be happy to know that the WUWT crowd now agrees that this is the metric for which to discuss the problem. If that is true then would you contact Mark Surreze and have a talk with him about how wrong he is about his ‘death spiral’? Honestly guys, isn’t the red trend line at least a little concerning? I think of polar bears as wild animals that would eat me alive if the opportunity were presented. I think the argument that hotter temperatures will ruin agriculture are hysterical. I think that sea level rise, like Gore’s inconvenient forty feet, is laughably overestimated. I think the connection between CO2 and temperature is uncertain at best. BUT we seem to be cheerleading for more ice just so we can thumb our noses and call the greens losers. There’s a clear trend, and we’ve no good reason to believe there will be more ice in 30 years than less. When the history is written on the stupidity of the AGW scare, we might end up as “the opposing group of fools” in the footnotes. It ain’t a 30-year wind pattern anomoly. The Center says the ice volume can’t be measured continuously because sufficient observations aren’t available. The Center estimates ice volume on the basis of limited observations, and as I recall, from proxy data on ice age. A related question: I think I remember seeing a video of wind-driven ice pack being pushed up onto the shore line (at least I think it was the shore line). It was pretty amazing to watch it happen in “real time”. Does anyone remember that video and possibly have a link to it? Unfortunately Pamela you keep spouting it even when the measured drift is expanding the ice and fragmenting it! Consequently you appear to be a one trick pony pushing the same line regardless of what’s actually happening. The quickest way to measure volume would be to pull the images into Photoshop or some other image processing software and do a histogram on the colors. You do realise these ice thickness values are forecast model outputs, not measurements? I don’t know what validation has been performed on them – there are few details on the Navy’s PIPS website. You might want to understand the source of these thickness values a little better before trying to derive ice volumes. Here is 2009. A small pressure bump appeared in August, but quickly disappeared. Nothing like 2007. Ice volume would be the best parameter to describe melting/freezing over the years, and would put AGW to something of a test. Ice extent remains important for albedo considerations. To be sure, the article opens with a picture of a pressure ridge. Ice locally packs up to a thickness of a dozen metres or more in such areas. I wouldn’t know if the total of these areas also amount to a significant portion of the total volume. I’m glad to see that Steve mentioned the blowing of ice down into the Atlantic, for I have read several times that that was a major factor in “ice disappearance” (the term that I use in preference to the misleading “ice melting”) in 2007. I have also read more than once that the water flowing into the Arctic was “warmer” than usual that year. I heard on our beloved (!) CBC radio that the number of “ice-free” weeks has increased in recent years. I don’t know what the “expert” (from Univ of Alberta) considered “ice-free”, for there seems to be ice over the north pole at all times, but is he onto anything useful in considering a supposedly increased period of time without ice? Or is this the successor to ice thickness as red herring of the month? Unfortunately, this is another consequence of the great I.P.C.C. political spin, where scientific reports have so routinely been sanitized to present the best scare scenario to suit the political and power agenda of a self styled world elite. Amazing that it became the “normal” (post normal?) route to follow the spurious spin and line up with hands outstretched to grab the billions of “research”?? dollars with Lapdog science where the spin not only hides the decline, it puts aside or conceals inconvenient truths, data, or explanations, and much worse rots the core by those that erected barriers to prevent or put down scientists who dared to question. Internet sites like Real Science were created to perpetuate this corruption, to give “them” the ability to smear, ridicule and attack, to bolster the myth that their spin on Climate Science was the only legitimate one, backed by (pick a number) consensus, and the “validity” of their climate science as trotted out through the political spin of the I.P.C.C. The fact that this crafted agenda initially worked and was not questioned, is an indictment on science, and indicative of the power and fear such a small group were able to wield against fellow scientists, power and influence that prevented scientists from pointing out obvious errors or advancing alternative explanations. My initial thoughts on this paradox was along the lines, that Climate science is so fragmented with competing theories, pet agenda, distributed over so many scientific disciplines, that this disunity or competition enabled politicians and charlatans to divide and conquer science to serve their own ends and agenda. The release of the CRU emails revealed the inner corruption and the extent that a small group could dictate and corrupt the peer review process, and prevent publication in so called prestigious science journals and also use the internet to smear the few well qualified that tried to point out the errors in their”spun science” or challenged their dominance in feeding scares to an unquestioning Main Stream Media. Fortunately the in the lead up to this event (CRU emails) some courageous scientists had already engaged the spin brigade, asked questions, demanded answers, which so much helped those of us that were puzzled at the scary “science” but, lacked the experience and technical knowledge to back up our observations and gut feeling that something was so very wrong with the Al Gore “religious” bums rush, to bring on new political change and economic changes, don’t question, don’t ask, the science is settled, just get out of the way its already too late!! Thanks to Anthony and all the dedicated people who have rallied and have the expertise to read the scientific literature, and to find the qualifications within that literature and question the methods and the models. It is time to really ask those scientists who have obviously raised alternatives in their reports, but have allowed others to misrepresent their reports to create an agenda selling scary scenario. I hope the US Senate calls these scientists before them to explain why they could not point these things out, or reveal issues that prevented from speaking out. That is the urgent action needed to prevent the political machine from galloping down a false path on the pretext of saving the world, and in the process masking their own agenda, be it removal of rights, social change, or outright corruption.! My rant, but I think it so fits what is going on at this time. Ice piles can be guestimated based on wind directions for any given year, thus can lead to what some call first year ice to be less than 12″ to greater than 45″. First year ice thickness is a function of both mechanics and freezing. Add the wind and you get a jumbled up mess of first, second, and multiyear ice that can be various thicknesses, not necessarily based on age. For those who think 2007 was “awful” or that this year will be bad, you may not understand that ice mechanics combined with wind dictate whether or not ice melts in place or gets driven to warmer climate and melts there. Ice Extent and Area is therefore not a good measure of greater or lesser AGW melt reasons or records as much as it is a measure of whether or not wind is pushing it here or there during the melt season. Clear sky conditions with low wind can also be a factor. So what we are really observing over time are weather pattern variations. Pure and simple. For those who consider that to be white noise, nature cannot produce white noise. Only carefully calibrated, gated, broad spectrum sound frequency emitting laboratory equipment can do that. I do remember you talking about winds many times! Yes, someone does put out a graph of Arctic sea ice volume. That would be the Polar Science Center. They produce a terrifying anomaly graph which tends to go only one direction, down. It is generated using PIOMAS, a numerical model. Frankly, it should not be taken seriously, and certainly not considered a source of hard numbers. It’s basically a “first attempt” that yields a computerized guesstimate by making several curious assumptions. Note the assorted “disclaimers” at the first link like “The purpose of this page is to visualize recent variations of total Arctic Sea Ice Volume in the context of longer term variability” and “For the Ice Volume simulations shown here…” Measurements of ice thickness are sparse and considered to be of not much value, satellites like the recently-deployed CryoSat-2 will be taking measurements of how far an ice chunk floats above the water (the freeboard) which will be used for ice thickness calculations. But without data on ice thickness for the Arctic area that’s taken on a continuous basis, we don’t even the basic data to compute a record of ice volume. And what looks like too many assumptions have already been built into PIOMAS. For example, that page mentions volume estimates using age of sea ice as a proxy for thickness, as in first year ice is thin while multi-year ice is thick. This contradicts the work of esteemed Arctic sea ice expert Dr. Barber, who verified by direct observation that what satellites were identifying as thick multi-year ice was actually thin “rotten” ice. Thus the PIOMAS model is at this stage less of a tool and more of a toy, interesting to look at but not of much use. Oh, the terrifying graph just got done taking a long break from being updated. Previously it was dated May 13, showing a near-vertical drop, up until yesterday (May 27) it hadn’t been updated despite a posted schedule of updates every 3-5 days (depending on data availability). Then yesterday it updated, index on the server says Last Modified on “27-May-2010 11:44”, new chart dated May 24 on the chart. What changed? One thing, the title now says “Arctic Sea Ice…” where before it just said “Arctic Ice…” so I guess they had to clarify that. As mentioned, May 13 had a near-vertical drop on the end, zoomed at 200% it looks straight and ends at about minus 8.8 anomaly units, with only about minus 9.5 anomaly units at the bottom of the scale. For May 24 they had to add some more units to the scale, the straight drop is now ending at minus 9.5 anomaly units. A drop of 0.7 anomaly units in just 11 days. Heck, at that rate it may all be gone by July. Cute chart. Use at your own risk. Great article. This demonstrates how the CO2-climate change as causal mindset limits the advancement of knowledge about climate. Steve, I’m glad you are finally seeing the value of computer models. They seem to be disparaged at WUWT. Your ice thickness “images” are all simple model predictions from the Polar Ice Prediction System (PIPS 2.0) of the Naval Oceanographic Office. The forecast systems are driven by monthly mean ocean currents and deep ocean heat fluxes derived from the Hibler and Bryan (1987) coupled ice-ocean model. 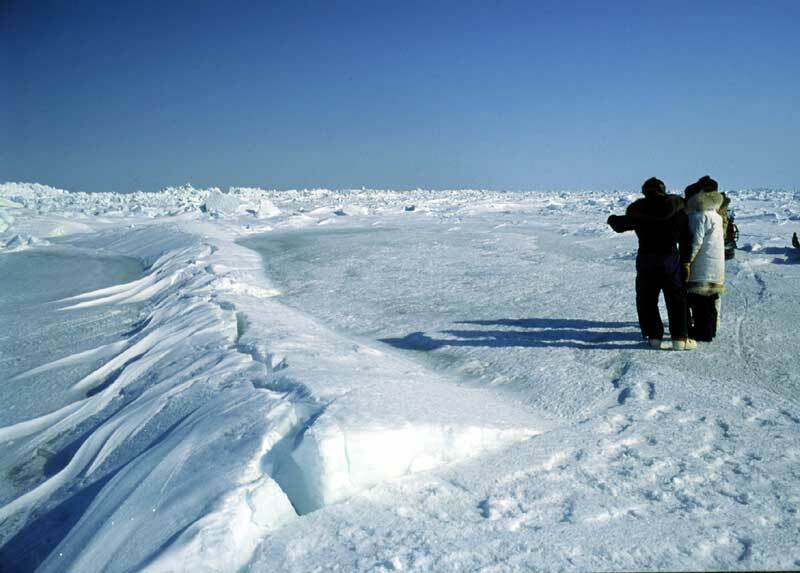 As of July 1996, a coupled ice-ocean model, the Polar Ice Prediction System (PIPS 2.0), was implemented operationally by FNMOC as a replacement for the three original forecast systems. PIPS 2.0 forecasts conditions in all sea ice covered areas in the northern hemisphere (down to 30°N in latitude). The horizontal grid resolution of the model is 0.28 degrees and uses 15 vertical levels. PIPS 2.0 produces forecast fields of ice displacement, ice thickness, ice concentration (ice edge) and the growth/decay of ice based on both dynamic and thermodynamic effects. PIPS 2.0 is driven by atmospheric forcing from the Navy Operational Global Atmospheric System (NOGAPS) (Hogan et al., 1991). Pretty low resolution, and not so accurate around the edges, but not so bad for a simple 1990’s model. The modern U of W model doesn’t appear to show Steve’s “snow shovel” effect, but to be fair to the old Naval sea ice thickness computer model, it was developed many years before ICESat was launched – models weren’t that good in the 1990’s. The PIOMAS model had the advantage of being developed in the 21st century, and using ICESat data (launched 2003), plus other satellite, airplane, and field expedition data to be “assimilated” by their model. But it’s not clear how long this “final development” has been going on – 10 years ? The major take-home message for everyone, especially the warm earthers among us, is that Arctic ice on a yearly basis follows weather events, and is not a global climate measure. Since it is a climate happenstance, and is not global, then it cannot, logically, be related to CO2 distributed uniformly in the atmosphere. Everyone should know this by now, but they don’t. Sorry for the coarse tone, but my wife scheduled and early morning eye exam…… on my day off. 😐 Can one imagine what we could have accomplished in terms of solving real problems if our resources weren’t spent on this contrived issue? The cost in terms of the human condition is immense. About polar bears……..one of the few animals actually known to hunt and track for days, mankind. Does anyone really believe these animals were indigenous to the north pole? I believe their frailty is completely overstated. Of course, then, too is the entire ecological/climate system of earth. We could try to learn from history instead of prognosticating with computer models that don’t factor in known historical dynamics. Hmmm, Real Climate have a post on verifying climate models. Thought I’d point out that one way of verifying a model would be to look for fluctuations in a variable (i.e. levels of man-made CO2 output) and compare with the presumed affected variable (i.e. levels of CO2 in the atmosphere). I pointed out that the Mauna Loa record doesn’t reflect the big drop in man-made CO2 caused by the 1970’s energy crisis, i.e. growing levels of global CO2 seem to be independent of man-made CO2 emissions. Didn’t make it past the moderators. Again. There are many factors that contributed to the anomalous September ice cover of 2007: (1) a thinner ice cover starting out the melt season than had been observed in previous years,(2) a strong summer Arctic Dipole pattern that persisted the entire summer, favoring both advection of warm air into the Arctic to promote surface melting and strong winds that pushed the ice away from the coasts of Siberia and Alaska, (3) anomalously clear skies during peak insolation and (4) warmer ocean temperatures. Several papers have been written about all these factors, and it’s not possible to say which factor was the most dominant. I would say however that thin ice played a large role since the atmospheric circulation pattern that set up in 2007 (and often referred to as the “perfect storm”) has been present in the past and yet such dramatic retreat of the ice cover didn’t happen. Thus, the reduction ice thickness that has been observed during the ICESat era, and earlier (based on submarine sonar observations) seems to be a key driver for allowing continued low September ice extents. But scientists agree that summer weather patterns remain important. Even for this coming summer, with what looks to be the lowest ice volume during the satellite era, the atmospheric circulation remains the wild card. I am curious why you now relied on modeled values of ice thickness and yet you discount the modeled results of ice volume from PIOMAS? What makes you trust these modeled ice thickness estimates from the Polar Ice Prediction System over the PIOMAS ones? Have you done an intercomparison of their techniques and assessed which one may be more accurate? This would be valuable information. My understanding is that this is still a difficult thing to measure/estimate particularly in the Arctic precisely because of compaction. IIRC WUWT posted a nice video sequence a while ago showing Arctic ice sloshing around – perhaps someone with a better memory knows which post. I could make an estimate …… but it would be nice to have access to the original data which the maps were derived from. Steven, just ask R. Gates or the folks @ UW, you know the much smarter than any of us computer modelers, with their reasonable (in their opinion) match to submarine measurements “ice thickness formulas” that used the data and clearly pointed all this out in there peer-reviewed study, published in – – – – – say what? They haven’t? They didn’t? It wasn’t? They need more money? Hmmm, must have my sound turned down…. Okay, I’ve turned the sarcasm off, but there is only two possibilities here: 1. They didn’t know, which means at best they are –D scientists, or 2. They knew and it didn’t fit their agenda. In either case, be it a failure of comprehension or a failure of inclusion, ALL their formulas, models and conclusions are inconsequential. I have a larger version of the chart and the 30 yr drop is from 7.9 to 5.5 – 2.4, and the 06-07 drop is 5.8 to 4.3 – 1.5. Doesn’t seem the same to me but I guess everything is relevant…. I’m sorry Wren, but I don’t follow what you are saying about ice “volume” increases due to “crumpling” being reflected in the ice “extent” measurements. 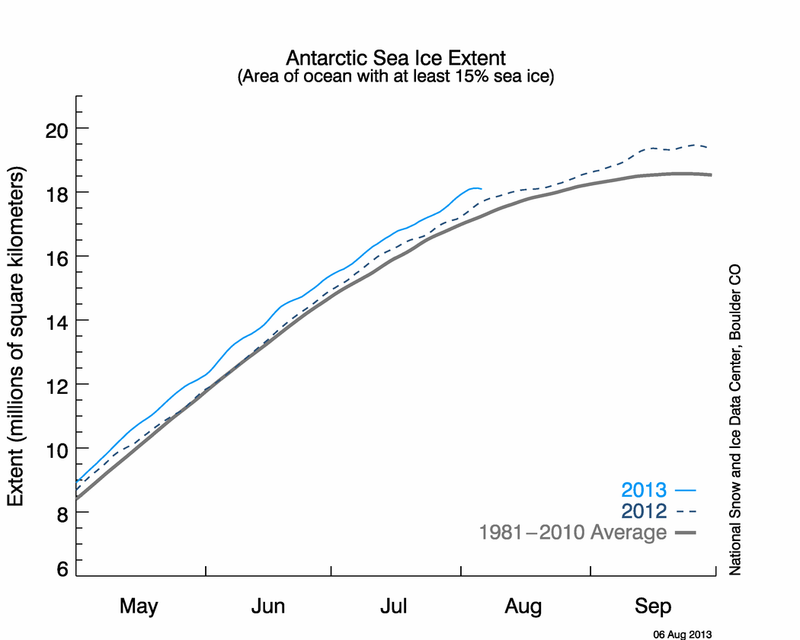 Specifically, the drop in ice extent…. is a measure of change which takes the crumpling into account In previous postings you (and others) have said “ice extent is not (i.e., the 2009 recovery) an indication of ice volume, which is the more important factor” or something to that effect… now your saying it is? I do computer modeling for a living and have for most of my adult life, so I am quite fond of computer models. Thank you for your keen observation, as always. There was a lot of multi-year ice pushed out into the Atlantic during the winter of 2007-2008. That’s really interesting. That means the ice there is really thick and melting in that area will basically stop in its tracks when it gets there in August, unless other factors act to disperse it somehow. Most of the snow and ice that disappears does so by the process of Sublimation. Which is the transition of a substance from the solid phase to the gas phase without undergoing intermediate liquidification. This process can start at temperatures well below 0 degrees C and is the reason ice cubes disappear when left in a freezer. It is sped up with sunlight and during summer there is 24 hour sunlight. But there are definitely more than this going on. We get these pressure ridges on our lake every winter. And even if it never gets above freezing, a strong sustained wind will open up water on one side and build a ridge on the other miles away. A lot of times when this happens, the water steams like a hot tub, when it is 30 degrees warmer than the air. It looks good enough to jump in. Pardon me, pwl, for writing about you rather than responding to you. But the strong interest you show in this new information about Arctic melt is the strongest evidence that can be offered to the effect that climate sceptics are seekers after knowledge while climategaters are not. As this report about sea ice thickness shows, our knowledge of the Arctic is very small and our climate science is still “a birthing.” Of course, some climategater will assert that they knew this all the time and that it was factored into the models that irrefutably prove that there is a disastrous melt of the Arctic in process. Climategaters, you are not participating in the scientific work. I have to pause here, and give R. Gates credit: He pointed out during the April Extent bonanza that the Ice was simply spreading out over a wider area. Now it’s bunching up into a smaller area. But unisys SST temperature shows below freezing water off of Pt. Barrow Alaska where the ice has retreated. I would expect a modicum of loss in the morphing of one extreme to the other, but not a loss figure that is implied. Antarctic needs the same examination. Anomaly is a two-headed monster: Cannot battle one head at a time, the other will eat you. “I’m glad you are finally seeing the value of computer models. It’s not really the models that people complain about, it is the claims made for them that upset people. This idea that models are inherently bad is a straw man type argument, although there are plenty of blog commenters who will spew it. Honestly presented computer climate models are certainly interesting. But to ignore there current limitations is to engage in deception. Personally, I think this site has become too focused on monitoring Arctic Sea Ice and reacting to every seesaw. Although I’m very interested in the topic, I feel updates every 3-4 weeks normally and weekly during the minimum period would be adequate. Anyone interested in the daily/weekly status can check the link provided on the home page. The PIPS data is updated with a new forecast every day, and it seems pretty likely that it is verified on a regular basis. Unlike the PIOMASS which apparently hasn’t been verified against real thickness data since 2007. It would be interesting to conduct a mass balance analysis to see if the assertion “Simple – the ice was compacting to the north as it was pushed by southerly winds. It lost area – while it gained thickness.” holds water. How does the mass of ice lost due to reduced areal extend compare the gain in areas that increased thickness? The one attempt of which I am aware (http://psc.apl.washington.edu/ArcticSeaiceVolume/images/BPIOMASIceVolumeAnomalyCurrent.png) doesn’t appear to support your assertion. Eyeballing model output doesn’t convince me of anything. The MISSION is to create a public demand for a transfer of authority over all decisions that relate directly or indirectly to the production and/or utilization of energy from the individual, to the collective as represented by the State. The GOAL specifically assigned to those State scientists involved in the study of arctic ice is to establish in the population as fact, that the arctic ice cap is rapidly receding, that its disappearance is is imminent and will itself be catastrophic, and much more importantly, That the demise of the icecap is irrefutable proof that CAGW is real and an issue that must be addressed without further debate. 1. Use a period of heavy ice years as the baseline. Report actual ice conditions as relative to the baseline or to the previous year, whichever is most impactive ( I love that govspeak word). 2. When total arctic ice is in fact decreasing, either relative to the baseline, or relative to the previous year, tell the truth. 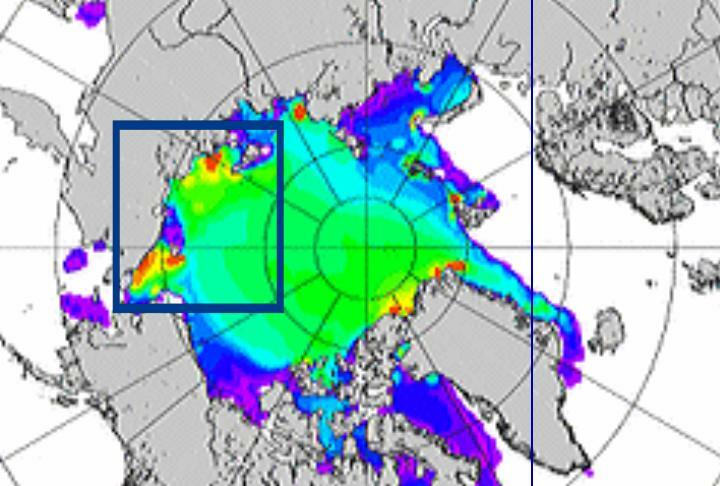 3.When arctic ice is stable in both extent and thickness report the growing preponderance of old and rotting ice. 4. When total ice is stable, but the thickness has changed report the either a decline in thickness or a decline in extent (whichever is true) . Don’t forget to mention the rotting ice. 5. When Total ice is increasing in both extent and average thickness, relative to both the baseline and the previous year, report the relative decline in old ice, and the (usual) decrease in average thickness as measured against the previous year. A comment on the vulnerability of new ice to rapid melting is useful here. 6 Always forecast ice decline for the near future. Such forecasts are a reasonable substitute for an actual loss of ice as they are certain to be reported widely in the MSM, while a failed prediction will be ignored. 7. Provide digital images, in a format appropriate for use by the media, of animals in distress, preferably mammals accompanied by their young. What a dichotomy global ice presents. Arctic ice is well below normal, and mainly on the Atlantic side, while the Antarctic is well above normal. Globally, we are pretty normal, just lopsided. Arctic being lopsided (for now), as well. Perhaps the melt season actually contributes to such increase, due to the breaking up of the ice into smaller sheets and floes. Lake Erie has been described as a “very wide river” and has a real current like a river. The current causes “shingling” of ice floes, where one floe climbs on top of another floe. This obviously makes for a greater total ice thickness when this happens. The weight of the upper floe pushes the underneath ice downward, of course. For a long time no one could figure out what was causing long furrows in the lake bottom (Lake Erie is quite shallow) until someone realized that shingling was driving the underneath ice deep enough to plow up the bottom. The furrows were due to the current carrying the floes, shingled or not, toward the lake outlet. Reading this article, with the currents and wind as described, I thought that shingling could explain some of the greater ice thickness. After all, 3 meters (10 feet) is not exactly huge icebergs, but is rather just floes. It is also about half the depth of many places in Lake Erie. I would suggest there is a practical limit to how thick ice floes can be and still be thin enough to shingle. Since the Lake Erie thicknesses are in the same general range as the numbers shown here, perhaps 3-6 meters is the common thickness range for such a phenomenon. For May 27, 2010, the Arctic Anomaly negative (-1.005) is completely balanced by the Antarctic Anomaly positive (1.063) as seen on Cyrosphere Today. It’s a ‘ dead heat ‘. Just prior to the inceasing thickness in the region on your map, we had the ice thinning and melting rapidly in July and August, as it does during the heart of the melt season. That thnner ice and currents and winds coming in from the Pacific side certainly made the mounding possible. As we discussed yesterday, it is a lot easier (i.e. it takes less forceful current and winds) to move and mound up thin ice. I would suggest had 2007 not had such thin ice to begin with, it could not have mounded up the way it did. Arctic ice extent is very close to normal. There is almost no year-over year variation at the end of May. The PIPS data is updated with a new forecast every day, and it seems pretty likely that it is verified on a regular basis. On each page you will find a forecast plot for the current day. Below are sample plots. In addition, the Ice Concentration page has an archive comparing previous PIPS 2.0 forecasts with actual conditions plotted from SSM/I data. Sounds to me like they only verify the easier “ice concentration” forecasts against “actual conditions” (satellite data), and never the ice thickness. Of course, I’d be happy to see a citation where you prove the Navy verifies the ice thickness modeled data that you used. I’m sure those lazy cubicle rat researchers at U of W. would like to see how those efficient Naval people do it, too. Unlike the PIOMASS which apparently hasn’t been verified against real thickness data since 2007. Exactly what measurements do you think NAVO has that U of W doesn’t ? Sea ice extent or global temperature averages may mean something (very little, really, IMHO, since our daily variances are often much larger than the range seen in climate anomaly graphs, and people and animals and plants survive such fluctuations with nary a shrug). The real thing to look at is how much the “anomalies” hover around the plus or minus values indicated by the SD. I’ve not seen any SD numbers per se on global temperature data, or on sea ice, but I would guess that 90% of the years are within those. And when one or two years are outside the normal fluctuations, big freaking deal. As the warmologists say, that is only weather, not climate. And since the Arctic and Antarctic are by definition opposites, are POLAR, their extremes should be expected to be more extreme. One would expect smaller variances in less extreme locations. Lots of ice or a dearth of ice in any particular year – holy cow! Especially phenomena like sea ice extent, which has only been measured for a few decades, and only WELL for maybe two decades, any conclusions being drawn are premature. As to data for prior periods, proxy data is and always should be looked at with serious doubt about any particular values, and the uncertainty of proxy values must be understood to be REAL – meaning the single value that came out of the computer should be seen as a VAGUE notion. Sea ice extent (and even volume) is something we should observe with the idea of just accumulating data. In the first several decades of the real sciences, people understood that real understanding wasn’t going to happen for a long time, but that at least they could gather data. Climatology at this time, without centuries of real, directly measured, data is still a science in its infancy – in the data accumulation stage. Just like Darwin noting down the new flora and fauna, instead of jumping to conclusions, they should just be keeping their noses to the grindstones and STFU. Darwin didn’t come to any conclusions while he was on the Beagle, and even decades later his “On The Origin Of Species” was a tentative construct. CAGW is a tentative construct, and a fair attempt at it. But it is only an early attempt and should be understood as just a first draft. Skeptics are doing there/our kibitzing and the proponents are doing their defending of it. That is really all that is going on. That warmologists believe they have some final and solid understanding of it is totally ludicrous and immature. Critics/skeptics are just being skeptical, as they/we should be. Why the warmologists are so strident and expressing such offended-ness in their defense of a first draft makes no sense. And how a first draft could have such a wide and vociferous following is truly amazing. Extremes are going to happen, especially with solid data sets over such a short period. Instead of being alarmed, they should be expecting to see some extremes, as the “normal” range defines itself. Sure, if we saw anomalies of 5C or 10C or half a million sq kms outside what had been seen before, we might be alarmed. But anomalies in the 0.7C range, or a few tens of thousands of sq kms? Gimme a break! Just write it down, CRU and GISS, and go STFU and quit speculating in public that it means X, Y or Z. Disappearing ice is interesting to know about, but do I detect some desire to refute warming as such, as distinct from CAGW? The PIPS minimum ice volume in September show a fall of 35% from 2000 to 2008, which compares to the corresponding PIOMAS value I estimate to be 5/12 or 42%. That’s not bad agreement for two independently constructed models – looks like there has been a very considerable loss in arctic ice volume over the last decade. I’m asking a question in ignorance here. When snow is being shoveled, it not only decreases in areal coverage, it decreases in volume (though not weight) simply by being scrunched into a denser mass. I realize that–unlike snow–ice is fairly noncompressible; but is there any room for thinking a relatively thin layer of ice could be pushed together, layer upon layer, in such a way as to push more weight into a given apparent volume? Why would or should they? It’s the US Navy! If I was in charge, I wouldn’t be telling anyone how good I am at predicting ice depth. … not so bad for a simple 1990′s model….. but to be fair to the old Naval sea ice thickness computer model – models weren’t that good in the 1990′s. Now who’s “disparaging” computer models? Could it be the Navy knows something about their model that YOU don’t? If I were a submarine Captain and I was going to “bet” my life and the lives of my crew on one of two models, the Navy’s or the Unv. of Washington’s, which do you think I would choose? And/or if I was the Navy why wouldn’t I just “deep six” PIPS and use that whiz-bang 21st century PIOMAS model? Oh, and about that ….. plus other satellite, airplane, and field expedition data I don’t see it except for some summarized mostly 1990’s (phew, 20th century stuff!) sub data. Where is it? I’ve looked everywhere on the UW site. When I go to the PIPS 2.0 archive in the source link (OP) I can’t pull up data from 1997 (it starts in 1998). Where did the 1997 prediction data come from? PIPS 1.0? Where do I find it? Bingo! I’ve now bookmarked it. Thanks! Ice “extent” is picked because it conveniently trends in the desired direction. Or it has for the past 30 years or so. I believe that trend is going to reverse and we will see an increasing trend for the next 30 years or so. Then you will no longer hear about “extent” and a different proxy will be chosen. You will be told not to pay attention to the man behind the curtain. Ignore the ice extent when it is rising, that is normal cyclical behavior. Only pay attention when it is declining because decline in ice fits the meme. Whenever anyone starts a post with “there is no need to think” I immediately assume that there is something interesting to be learned. Seems to me like the “same old , same old”. A pet hypothesis of those who believe CO2 has a strong effect on global temperatures seems to be that while CO2 concentration increases lag temperature increases in the paleolithic records, Milankovic cycles may initiate the change from ice age state to interglacial state but CO2 releases are necessary to act as a strong amplifier to boost the climate to the warm state. This idea may be okay as an embryonic hypothesis, but it seems to have been promoted by “argument from ignorance” to a higher level of credibility by proponents of the “climate is exquisitely sensitive to CO2” camp. Caveat Emptor! Might be interesting (or completely irrelevant…tbd) to overlay icebreaker activity/paths across the Arctic with the videos of ice movement/coverage. How much has icebreaker traffic (miles of icebreaking) grown/varied annually since 1979? Wind & water currents are immensely more powerful, certainly; but having a nudge from mankind *might* make a measurable difference. It sure seemed to on our inland Wisconsin lakes in the spring. Is there anyone actually out in the Arctic who is looking at the real world?? SG: Arctic ice extent is very close to normal. Definition of ‘near normal’ duly noted. So we see that what is happening in the Arctic is offset by the Antarctic, and that nothing is occurring beyond the parameters of past natural variability. What is happening now has happened repeatedly in the past. As we see it is not a global effect, but only regional in extent. Finally, it should be remembered that the Earth’s equatorial temperature has remained within ±1°C during the past billion years. The equator is at the same temperature today that it was in Alexandria, Egypt, when Eratosthenes measured the planet’s circumference in 230 B.C. But as one travels toward the higher latitudes, there is more and more cyclical variation. Thus, the Arctic and Antarctic, which are Polar opposites, are very often out of step as they are today. What is being observed is simply natural climate variability, nothing more. Despite the frantic arm-waving over the Arctic by the alarmist crowd, no one has been able to provide any evidence showing the cyclical change in the Arctic ice extent is due to human activity. The income and employment of numerous government scientists is not sufficient reason to jettison the scientific method, and give in to fear mongering over these routine Arctic cycles. It’s of some importance, but not a “tipping point” parameter. The range of albedos of open water overlaps those for ice, given the high zenith angles of the Arctic. The emittance of sea water is about 0.993, almost a black body; thus sea water can shed heat faster without an ice layer on top of it. The reason we were all focusing on extent until recently was, as RR Kampen indicates, the net average albedo was believed related primarily to ice extent, not thickness, and a tipping point was assumed possible. Thickness is, as of this moment, a red herring–hard to measure and not available historically. There’s something rotten, all right, but it’s not Arctic ice. OMG ice extent is almost 6% below the thirty year mean. PIPS shows a 20% loss in September Arctic ice volume from 2007 to 2008. Why do you think the UofW analysis, which shows a similar loss, is playing up? R. Gates also cherry-picks by showing this graph of the Arctic. 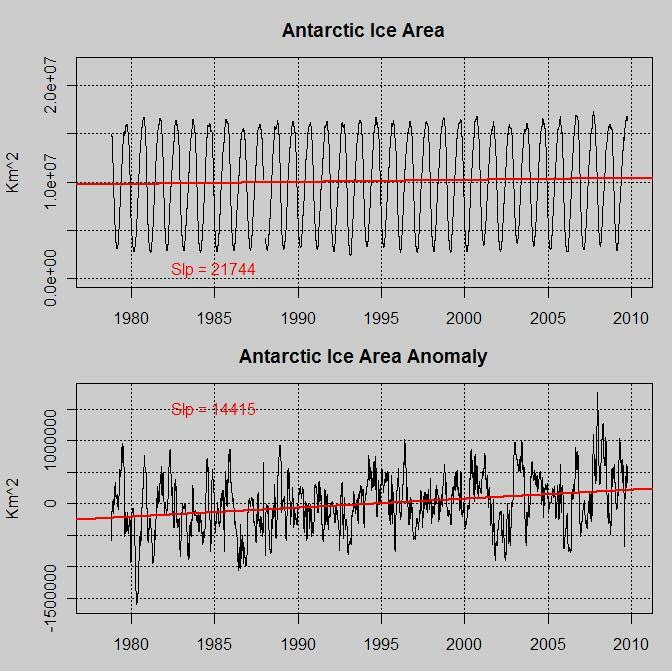 To be objective, here is the same graph of the Antarctic. I wonder why he omitted the Antarctic? Now everyone has the global facts, and can make an informed decision for themselves. I’m not sure what “normal” means, but it was above the mean a few weeks ago. You are right on the mark. The average is not the mean. For predictive value, trends must assess the mean and sd. (x±sd) for it to have any value. Looking at the GISS map, where they claim mean and sd, it is suspicious. The reason we can suspect that, is because the sd band is uniform, even when the variance should be high (during high melt or during high reconstitution seasons, the variance must be higher than at times of little or no change (i.e. dead of winter or dead of summer). What they have done here, is (IMO) a group s.d., that is, assessing the variance of all the measurements and applying this throughout. This is a bogus way of handling data. On Excel or Lotus graphs, you can choose between doing individual point variance, the right way, or assign an sd number based on overall variances for the whole record. I think that latter is what happened on the ice graphs I see. If anyone wants to do it right, he has to assign error bars to each sampling point at every time. Then one will see the bars grow and recede during periods of high and low variance, i.e. when ice is growing and receding most rapidly. Right now, at period approaching steepest slope, the error bars should be highest, but they are not. I’m a life scientist, not a statistician, so I would like a proper “Statsman” (as opposed to Statesman) to weigh in on this. (Statsperson?). Could you make that STAT, please? This was related to a study of polar bears around Churchill, Manitoba, probably the most studied polar bears in the world. Researchers have been studying them for 40 years and many of the bears have GPS collars so they know their movements, many are captured and weighed to see what the effect of diminishing ice has on them. When the ice period is less, they come off the ice with lower weight. Recently they did some studies using CLIMATE MODELS from the UK and the US to determine the impact on the CHURCHILL area – and of course they got 50 years of rising temperatures, sea ice declines of 7 days per decade which of course in 50 years would be disastrous for the polar bears of Churchill. But … its a MODEL. This article is from 2004 but it essentially the same discussion that was on CBC last evening (May 27, 2010). Be interesting to compare 2004 – 2010 actual information to the 2004 projections that predicted a 3 to 5 degree increase in the region’s temperature over 50 years. Historically, this is the increase in the area and in the IPCC report for some years prior to 2002. But it was warmer back in the days when the Hudson Bay Company was operating the fur trade back there, and it appears not to have warmed significantly since 2004.
against assuming a persistent warming trend. The information presented on CBC last evening appears to be based on old studies and preconceived outcomes. The concerns are real, but the future, as always, is unknown. You are the one determined to prove pips wrong. Please come back when you have that proof. Serreze and other researchers have published many papers since then, examining the effects of wind and other forces on the ice. So wind effects are hardly news. If you read through older Arctic research, you see a gradual shift away from the belief that seasonal variations and cycles such as the Arctic Oscillation, by themselves, could explain what we were seeing in the Arctic. Mark’s “death spiral” colorfully referred to the possibility that positive feedbacks were leading towards a seasonally ice-free Arctic Ocean as early as 2030. That is decades sooner than the 2007 IPCC report suggested, but today I think many Arctic researchers consider even 2030 to be optimistic. WUWT authors have made opposite predictions. The ice will decide, eh? So this just proves what has been said for years: that neither size nor thickness alone really matter, it’s what you do with the combination of the two. We’ve already seen how the various agencies have adjusted recent temperatures upwards with various tricks and lowered past temperatures to support the agenda. I’m just saying. Looks like they don’t want your type in charge at NAVO, seeing as how they put their forecasts on the Web and publicly explain how they will do better soon. If they don’t want to explain how they verify their model, you are free to ignore it as GIGO. the quality of operational models and forecasts. Sounds like they will soon have something like PIOMAS. Now who’s “disparaging” computer models? Could it be the Navy knows something about their model that YOU don’t? Admitting that these kinds of computer models gets better every decade is not “disparaging”. Note above – the NAVO admits PIPS 3.0 will be better than PIPS 2.0. If I were a submarine Captain and I was going to “bet” my life and the lives of my crew on one of two models, the Navy’s or the Unv. of Washington’s, which do you think I would choose? And what possible scenario would that be, Bob ? Russian roulette with a climatologist ? Because a real submarine Captain would be using sonar to see how thick the ice above him was, not some low resolution sea ice thickness model. And/or if I was the Navy why wouldn’t I just “deep six” PIPS and use that whiz-bang 21st century PIOMAS model? Gee Bob, if you were the Navy would you try to save the taxpayers money, or would you try to do everything in-house to protect your turf ? Would you spend $60 billion on a plane and let the Air Force spend $65 billion on a similar plane, for instance, or would you have thought of something like the F-35 Joint Strike Fighter decades ago ? “Ours is better for our needs”. They [The ones that support AGW] seem to be disparaged at WUWT. I am a big fan of computer models – when they produce useful information. Garbage in, garbage out. Has anyone noticed that the same computer modeling techniques and “quant-types” predicted that sub-prime mortgages were safe? The irony is delicious. Wall Street models = Enviro models. BTW, the “Ice Thickness Chart” R.Gates has linked to a number of times is also from UW, but I can not find any real world confirmation data (raw or other wise) supporting it’s creation. It appears to be 100% computer model generated based entirely on assumptions. I found a computer simulation of Arctic ice produced by The University Of Washington, which struck me as being particularly disconnected from reality. Everybody with a basic understanding of science knows that climate models have no validation and thus zero predictive skill. It is amazing that the garbage produced by climate models is actually reported and believed by some. Model results are just information, not measured data. They form part of our information base, they are not knowledge and they can never impart wisdom. It’s a shame that modeling gets misused so often. Didn’t the Catlin “Ex-perdition” group pass through that area? Really nice animation of the 2007 melt. Shows how melting begin in the Bering sea, then penetrate the Bering Strait into Chuckchi Sea and turn east towards East Siberia Sea because of prevailing winds. Clearly the cause of the melt is warm water entering the Arctic through the Bering Strait, augmented by the southerly winds that year. I can say that because none of the Arctic warming is caused by any greenhouse effect, and much less is it influenced by a mythical “Arctic acceleration” of the warmists. It began abruptly at the turn of the twentieth century after a two thousand year cooling trend. This sudden start immediately rules out carbon dioxide as a causative factor. The true cause of this warming was a rearrangement of the North Atlantic current system at the turn of the century which directed the Gulf Stream to its present northerly course. There was a pause in warming between 1940 and 1960 but warming resumed and continues today. The Gulf Stream today keeps the Russian Arctic ports ice free in the summer and has eaten away approximately a third of the arctic ice that would exist in its absence. If you look at the animation carefully you notice that almost all of the melt takes place on the Bering Strait side of the Arctic and the Gulf Stream side changes very little. That is because the flow of warm water through the Bering Strait is variable and winds can modulate it strongly as happened in 2007. For more info see “What Warming?” available on Amazon.com. Maybe there is a reason arctic residents refer to spring breakup, not melt up. That’s a little odd Steve. You seemed fairly sure a few weeks back …. 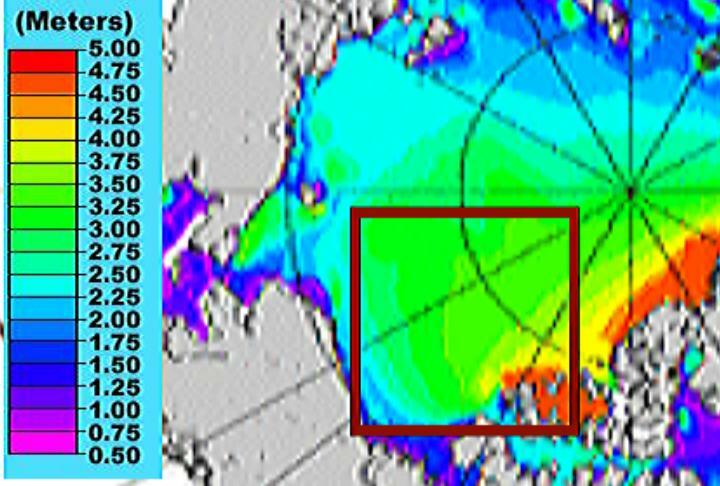 <a href="http://wattsupwiththat.com/2010/03/31/arctic-sea-ice-about-to-hit-normal-what-will-the-news-say/&quot; Back in March there seemed to be little or no confusion. There we have it – ‘normal’ is the mean used by NSIDC. Or, on Planet Goddard, when the observations drift beyond 2 standard deviations of ‘normal’, hey – it is still ‘very close to normal’. Nothing to see here. BTW .. One of the ice experts must have known this [some of the 2007 extent reduction was due to compression and wind effects]. One presumes a writer on the Arctic ice has done his homework and is familiar with the publications of Son Nghiem? This is one of my favorite ice sites. It was put together for the walrus hunting locals. They even refer to “local experts”. I wonder if that means Inuit? …all the fuss about global warming is grossly exaggerated. Here I am opposing the holy brotherhood of climate model experts and the crowd of deluded citizens who believe the numbers predicted by the computer models. Of course, they say, I have no degree in meteorology and I am therefore not qualified to speak. But I have studied the climate models and I know what they can do. The models solve the equations of fluid dynamics, and they do a very good job of describing the fluid motions of the atmosphere and the oceans. They do a very poor job of describing the clouds, the dust, the chemistry and the biology of fields and farms and forests. They do not begin to describe the real world that we live in. The real world is muddy and messy and full of things that we do not yet understand. It is much easier for a scientist to sit in an air-conditioned building and run computer models, than to put on winter clothes and measure what is really happening outside in the swamps and the clouds. That is why the climate model experts end up believing their own models. You seem to be determined to discuss anything but the topic of the article. Why is that? Last time I said anything about Ice it was that Lake Huron was clear of it by me, then the next day instead of water I saw wind blown ice piled up 3 feet above the water level; The same thing in the arctic shouldn’t be a surprise. This sounds like a “which came first, the chicken or the egg?” Did the oceans “burp” because they became warmer and released CO2? How can you keep lying like this KNOWING it is going to devastate entire economies, KNOWING this will ultimately leading to a large number of deaths? How can you still sleep at night KNOWING you have been a traitor to your fellow human beings? Steve, congratulations on a nice bit of research. I am waiting for R. Gates to try and refute this as usual. I some times wonder if he is actually paid for his obfuscating. Steve Goddard : You may have noticed that appeals to authority don’t carry much weight around here. What’s Up With That? More seriously, as a physicist I yield to no-one in my admiration, in that field, to Freeman Dyson. However, anyone can over-reach. That is the best place to be asking a question from, shows you want to get out of there. Ice may be incompressible, but sea ice effectively can be compressed. Extent numbers use a minimum Concentration of Sea Ice, usually 15%, so for a given area what is reported may be up to 85% water. Like with a mug filled with slush, the ice part can be squashed together, squeezing out the water part. When done, you have a dense block of ice, which for extent figures is much smaller as the water part, having less that 15% sea ice, is no longer considered. When shoveling snow, you can pack it and squeeze out the air. With sea ice, especially with low concentrations, you can basically pack it and squeeze out the water. I know where all your ticks went Steve, they all packed up their bags and headed for North Carolina. I am picking off 2 or three a DAY and my poor animals need to be inspected and picked clean this year too. Try taking ticks off a horse’s inner thighs when he really wants to kick your head off or a billy goat with two foot long horns who resents having ticks removed from his eye lids. Models that predict sea ice are simplistic, with a minuscule amount of variables compared to trying to forecast global climate. The ice model is going back and extrapolating a linear trend that reproduces each season relatively well. If I wrote a model for my current weather in Florida, and only went back 5 or 10 years, I would probably be within a standard deviation of the mean for the last couple years going forward a year. That is like saying that my big toenail grows a millimeter a month, and now I will write an Excel regression and project that going forward the next six months. Wow! Just about right on! That must mean all models are good! Yeah, that’s the ticket! And Anu – congratulations! Just when I thought that you had committed every logical fallacy know to Aristotle, you outdid yourself! You committed the fallacy called inappropriate generalization with your argument from the specific (Navy model good) to inferring from that the generalization (Ergo, All Models good). I’ve seen a person shoot someone dead. Therefore, all people are murderers. the rest of the article consists almost entirely of misleading, irrelevant, or erroneous information about Arctic sea ice that add nothing to the understanding of the significant long-term decline that is being observed. The puzzle is this: with that blot on one’s CV, how did one become apparently the inhouse authority on the topic of Arctic Sea Ice at WUWT? For a real appeal to authority, check out the guy in the funny hat from your link who says: “We already know that the global temperature sensitivity to equivalent CO2 doubling is near 3 degrees C.” A mere software engineer pretending to be a climatologist, or a physicist? Ri-i-i-i-ght. Preaching that ‘we already know’ that sensitivity is around 3°C ceratinly comes across as ignorant. When he says ‘we,’ maybe he’s talking about himself and the gerbil in his pants pocket, but we “already know” no such thing. In fact, the planet itself is telling us the sensitivity number is almost certainly below 1°C, and very likely no more than half that. What we do know is that every UN Assessment Report has ratcheted the sensitivity number downward. We also know that the UN/IPCC’s prognosticators are all political appointees, with marching orders that require a high sensitivity number for their agenda, so they keep the number as high as they think they can get away with. The real world is different. With a 35% increase in CO2, the planet’s temperature has risen only about 0.7° — and a large part of that rise is due to the natural warming since the end of the LIA, which would occur with or without a change in CO2. It is entirely possible that the effect of CO2 is so close to zero that it can be entirely disregarded. It certainly is too small to measure. I really tried to read your link, Phil. But I gave up at the point when the guy in the funny hat started tooting his horn about writing an article for RealClimate. With credibility that low, I’ll stick to reading what a genuine authority writes. Hey there Phil Clarke. Freeman Dyson, Tim Ball, Richard Lindzen. Nobody is good enough for you. You have been spanked repeatedly, and yet you keep coming back for more. That is the actions of someone who is being paid to do that. I see no other explanation (by that I mean someone who is in fear of losing their grants). You nit pick and find the slightest chink in the armor, instead of arguing the given points. You are like a child. What are YOUR credentials, by the way? More seriously, as a physicist I yield to no-one in my admiration, in that field, to Freeman Dyson. (…)This isn’t a serious article, it’s an intelligent but essentially uninformed rant. Unfortunately I have to call it irresponsible. To anyone but Phil Clarke: Remind me to never “admire” my parents in such a fashion. Thank you Steven Goddard. Fascinating! In the interest of saving space, I won’t repeat your entire post, but Webster’s says an event is a ” noteworthy happening.” Because the 2006-2007 decrease was the largest one-year decrease in sea ice in 30 years, it was a noteworthy happening. The year 2009 is only 1 year out of the 30 years in your chart. You haven’t shown 2007 had more crumpling than the 30-year average. In related news, while the credibility of the AGW proponents is shrinking, their resistance to logic and evidence appears to be thickening. Do you ascribe the same reason to Steve G for doing the same? As someone that has lived with frozen ponds, frozen lakes, frozen rivers and frozen seas. Let me assure you that water, in the wild, FREEZES from the TOP DOWN and MELTS from the BOTTOM UP. When the wind chill air temperature gets low enough energy loss from the water surface gets fast enough the water freezes. As the energy loss decreases the bottom of the ice melts. No need for warm, above freezing, air temperatures. Liquid water at freezing temperature will not begin freezing until it loses more energy to make the phase change and will change back as soon as more energy comes up from below. Aristotle said motion had to be caused by a force. To explain why an arrow kept flying after the bowstring was no longer pushing on it, he said the air rushed around behind the arrow and pushed it forward. We know this is wrong, because an arrow shot in a vacuum chamber does not instantly drop to the floor as it leaves the bow. Galileo and Newton realized that a force would only be needed to change the arrow’s motion, not to make its motion continue. Natural motion, such as falling, came from the tendency of objects to go to their “natural” place, on the ground, and come to rest. Voluntary motion was the type of motion exhibited by animals, which moved because they chose to. Forced motion occurred when an object was acted on by some other object that made it move. Apparently sitting on a chair and just thinking “logically” does not a scientist make. Of course, Aristotle lived in the 4th century BC, so he had an excuse for getting some things very, very wrong. An excuse nobody here has. That’s the lowest for this date since 2003. Alright, games over, time to go home. Anu, you can pick up your little plastic trophy over at the desk. See you in September! Sea ice is a little different. As it approaches the freezing point, it becomes more dense and sinks. As a result, several tens of metres of ice have to reach the freezing point before any starts to freeze. As a result, there can never be any warm water under the ice during the autumn and winter when the ice is thickening. Walt Meier has personally apologized to me for his remarks, and he shortly thereafter recognized that there was a discrepancy between NSIDC and UIUC maps just as I said. It appears that my observations are putting you on edge. I wonder why? 2007 minimum – the ice area/extent was certainly down, but no big deal. Main reason losses due to winds blowing vast chunks down the Fram Strait (and smaller chunks down Kennedy). Compaction also played a part. But warmer incoming sea currents also a factor. So these are all effectively weather events, rather than anything to do with the alleged global CO2 induced average temperature increase. But I don’t dispute that the Arctic warmed a little in the late 20th Century. Just like it did in 1922, the 1940s, and in 1817, the MWP, and many other periods further back in the holocene. As I said, the very slight warming of the late 20th C is no big deal. The Arctic sea ice melts/sublimes/disappears for 6 brief weeks in summer, and starts to freeze again PDQ in late August/early September, even in warm decades. Given how the Arctic is supposed to be in it’s death spiral, and yet the whole of the NH (except West Greenland and Eastern Canada) has just had one of the coldest winters for many years, I think much more time and money should directed towards investigation of the AO and the related jet streams, which appear to have much more significance to the climate most people on the planet experience. You have to correlate that information with their host populations, and the character of the ground cover. Female ticks are obligate feeders for reproduction, and have modest host species specificity for fecundity. Depending on which species you normally encounter, look at the local populations of rabbits and lagomorphs, coyotes, dogs etc (or deer if you’re talking about deer ticks). Land use practices are a big factor – reduction of old-field conditions, plowing, grass and forest fires, especially in successive years will drop tick numbers dramatically, as will repetitive spring dry spells. As an aside to the aside, do that kind of research for a bit and you’ll come to fully appreciate the cute pictures of chimpanzees mutally grooming one another in African forests and plains… LOL! I have a question regarding the pictures shown in the above URL: What’s the deal with those lines radiating rather equidistantly from the pole, extending about 500 miles each? It’s like a great big asterisk. The date shown is for May 28, 1980. Gail, try a quick dabbing with vaseline, just enough to coat the tick. The tick then can’t breath and will back out and die, no extraction need be done. Plus there is no risk of leaving the head behind. Maybe neo/polysporin or the like would be even better to help prevent infection if that is a concern. Who’s going to wake him this summer ? Does he have a live-in nurse or something ? 2 million mi^2 = 5,180,000km^2, to keep it to 3 significant digits. 2007: 5,166,250km^2 on August 18. September would have been too late. 2008: 5,178,281 on August 27. Too late again. Which brings up an interesting observation. 2007 and 2008, links are to the wrap-up press releases. 2009, link is to an Arctic Sea Ice News, not the press release. Why? Daily numbers and images are not archived because day-to-day variability can reflect instrument or processing errors. The monthly data products are a more reliable record of ice variability. The average ice extent over the month of September, a reference comparison for climate studies, was 5.36 million square kilometers (2.07 million square miles) (Figure 1). So NSIDC isn’t worried about any particular daily number when considering the yearly low. So why should there be a big fuss over one? I hereby take that back. The number must have been revised later, the big data file now says May 28 had 11,211,719 km², so the 2006 record of 11,199,844 km² hasn’t been broken. Ever tried wart remover on a tick? Or that new freeze stuff in a tube? Works well too. But not on inner thighs. No thanks on that one. Me or a horse. Yes, that would be less than 2 million square miles. There are different ways to report it – whether someone is “worried” about one aspect or another is a separate issue. I was just showing years that went below 2 million square miles – an event important enough to wake up Joe Bastardi over; whoever he is. I was responding to the (paraphrased) quote by Andrew P. – just scroll up. I’m saying each of the last 3 years had Arctic ice extent minimums below 2 million square miles. I only spent about 1 minute looking in the NSIDC data for lowest day of the year for 2007 and 2008; it was quicker to find the average for the entire month of September. Since the average sea ice extent for the entire month of September met the requirement, there had to be at least one day that met the requirement. You’re free to do the additional 3 minutes search to find the days in 2007 and 2008 with the minimum extent for the year – they will both be less than 2 million square miles. Sorry, that plastic trophy is rightfully mine. The long-standing “Rules of Play” doctrine has prohibited sports officials from changing after a competition the decisions of officials during the competition. Have you thought about using nail polish? A. This is Anthony Watts’ site thus Anthony Watts’ rules. He is final arbiter. “Rules of play” do not apply unless he lets them. B. I called it early, my mistake. I learned later that was a preliminary result, one needs to wait for the official “fixed” result. C. I have no authority to call an end anyway, I’m just an ordinary commentator. Like a baseball fan who leaves the park in the eighth inning certain his team has lost, thus missing the ninth inning comeback and win, I’m no official so I can’t call a winner. Now if you, who watches Arctic sea ice a lot, knew that wasn’t the final result but still grabbed the little plastic trophy and ran, well then….